I got a hermit crab. 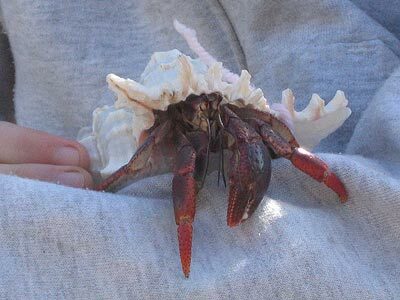 A hermit crab is a little crab that chooses its shell instead of having a shell that grows on it. You can put a few shells in with one, and it'll change shells after a while, and that's pretty cool to see. I named him Glen, but I don't really know if it's a boy or a girl. I try to make him feel safe and warm and happy. His plastic cage is pretty small right now, but I'm going to save up aned get him a bigger one and maybe a friend. Until then, I take him out as much as I can and let him crawl around the floor. I think his pet store food must get pretty boring, so I let him have some lettuce today. Tomorrow, I'm going to see if Glen likes peanut butter.And I always talk to him and make him feel good. I say I love you Glen. I'm so glad you're here. I think you're the best. I know it must make him feel good. Hey glen, you got an interesting blog here! I'm definitely bookmarking you right now! That's a pimped out shell you got him there. You're spoiling him already. And he's crwling on my favorit sweatshirt!